Today, almost every store and service is providing some sort of loyalty programme or reward card – from Watsons to H&M to Singapore Airlines and even your local bubble tea shop (get 10 “chops” to exchange for 1 free drink type of rewards). There have been several occasions when I was doing spring cleaning of my drawer and only to discover that I had forgotten about 2-3 reward cards and their points/rewards had all expired. The only way to remember about all these reward points is to carry their cards in my wallet – it is already a huge challenge fitting just my ez-Link card, namecards, credit cards and cash in my wallet and to try to squeeze in my various reward cards just does not make sense. This is where I thought the concept of Giift.com makes sense – a digital wallet to manage all my loyalty programmes and gift cards. Signing up for Giift.com services is simple – just sign up with your facebook or google+ account and you are in – no long and annoying forms to fill. The loyalty programmes and reward cards you can choose from in the Giift.com list is quite extensive – covering the most popular loyalty programmes e.g. Watsons, Krisflyer, Popular, Passion Card. Giift.com currently tracks more than 500 programs and cards worldwide, so it should encompass many if not most of those we regularly use. Just to manage expectations – the automatic tracking of points works only for some programmes. As there are so many different loyalty programmes and different companies use different systems to manage their own programmes, Giift.com can only do automatic tracking of points for a handful of companies. For example, your Watsons Card membership cannot be tracked automatically – you are given the option to input your points manually. Besides being a digital wallet for your loyalty programmes. Giift.com is also a social platform where you can connect with friends and exchange unused loyalty or reward points with them. You can even get paid simply by recruiting your friends to register. You can also find the best deals in town with Giift.com – for example, when I inputted my Krisflyer membership, the sidebar shows me the destination I can fly to for 12,000 Krisflyer miles. 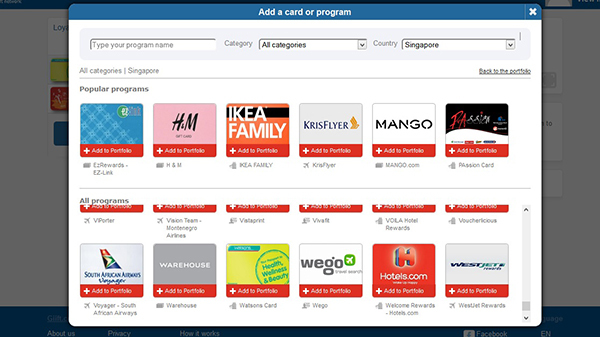 Similarly for IKEA points and other loyalty programmes available in Giift.com. There are also options for you to convert points from one loyalty programmes into another loyalty programmes e.g. you can do so with Hilton points. Do note that not all loyalty programmes allow for exchanging of points for cash or one company’s points for another company’s points. Furthermore, a lot of Singaporean retailers use Giift.com to create their own eGift Cards and Loyalty Programs e.g. Lawry’s Steak House does that. That means ease of tracking of such restaurants and services’ loyalty points via Giift.com too. The concept of Giift.com is a good idea – tracking all my rewards online in a one-stop portal sure saves me the heartbreak of rummaging through my drawers only to find an expired gift card.